I can only advise the party on the defensive not to divide his forces too much by attempting to cover every point. Serious trouble for General Walker developed in the east during the threatened enemy breakthrough in the Naktong Bulge. 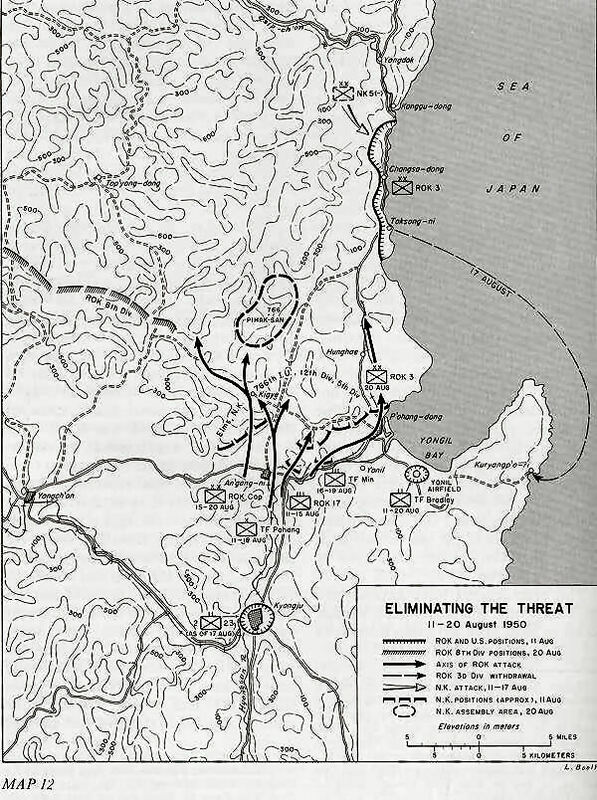 North Korean attacks in the Kigye and P'ohang-dong area became critical as the ROK divisions there suddenly gave way and threatened to collapse. The blow came with a suddenness that contained the element of surprise. Eighth Army, low in reserves, was ill-prepared to meet an enemy breakthrough in the east, with its main forces already fully and even desperately engaged elsewhere. Through July and into the first week of August, there were repeated rumors and reports of strong guerrilla groups in the mountains ten or fifteen miles northwest of P'ohang-dong. These reports in time were treated as casually as the repeated cry of "Wolf!" by the boy in Aesop's fable. From Taegu a lateral highway and railroad ran east to P'ohang-dong, 50 air miles away. This lateral corridor is the first valley route to the east coast of Korea south of the Seoul-Ch'orwon-P'yonggang-Wonsan corridor, 225 miles to the north. Situated on this route about midway between Taegu and P'ohang-dong is Yongch'on. There, the only important north-south road between Taegu and the east coast comes down from Andong and Uisong through the mountains to meet the lateral valley road. East of this road for a distance of 40 air miles to the coast, lies a rugged mountain area entirely devoid of improved roads. Twelve miles west of P'ohang-dong in the lateral Taegu corridor is the town of An'gang-ni, and 6 miles north of it is the smaller town of Kigye. The latter is situated at a point where several trails and a poor road debouch southward from the mountains into a north-south valley that enters the Taegu-P'ohang lateral corridor at An'gang-ni. This north-south valley continues on south past An'gang-ni to Pusan, 60 air miles away. Kyongju, an important rail and highway center in the Taegu-P'ohang-Pusan triangle, lies 12 miles south of An'gang-ni in this corridor. These terrain facts explain why the towns of Kigye, An'gang-ni, and Kyongju assumed importance in the eastern battles. At P'ohang-dong the coastal road from the north swings inland along the Hyongsan-gang to a point less than 2 miles from An'gang-ni where it bends south and enters the Kyongju corridor to continue on to Pusan. 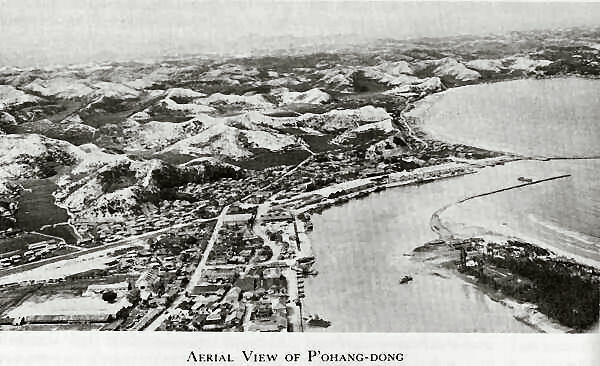 Militarily, P'ohang-dong itself was of slight importance, although its port permitted a partial supply by water of the ROK and the small U.S. forces on the east coast. Rather, it was the eastern half of the Pusan Perimeter communications net, the Taegu-Yongch'on-An'gang-ni-Kyongju-Pusan route-almost a sea-level valley route the entire distance-that was of critical importance. If it should be cut by the enemy for any appreciable period of time the Taegu position would become untenable. Contrasting with the rugged terrain and the lack of a good communications system in the enemy's field of operations in the east, General Walker had the interior valley rail and highway net over which he could rush reinforcements to the area. He considered as another source of U.N. strength the proximity of the Yonil Airfield six miles south of P'ohang-dong, and within two to five minutes' flying time of the critical areas, should the North Koreans reach the lateral corridor. The first of these divisions, the N.K. 8th Division, failed to penetrate to the Taegu-P'ohang lateral corridor. Near Uisong on 9 August, the ROK 8th Division caught part of its forces by surprise and almost annihilated one battalion of the 3d Regiment, causing 700 casualties. The division's 2d Regiment then entered the battle and itself suffered heavy losses, though it won back the ground previously lost to the ROK's. The events around Kigye and in the mountains to the west of P'ohang-dong from this point on can be understood in their true light only if one knows what was taking place simultaneously on the east coast, only a few miles away. To bring those events into their proper perspective it is necessary now to review them. A previous chapter recounted the series of bloody battles on the coastal road between the N.K. 5th Division and the ROK 3d Division through the first days of August. The fighting seesawed around Yongdok for two weeks, with first one side and then the other holding the town. This action. had ended with the ROK's temporarily regaining Yongdok. But they held it only briefly. 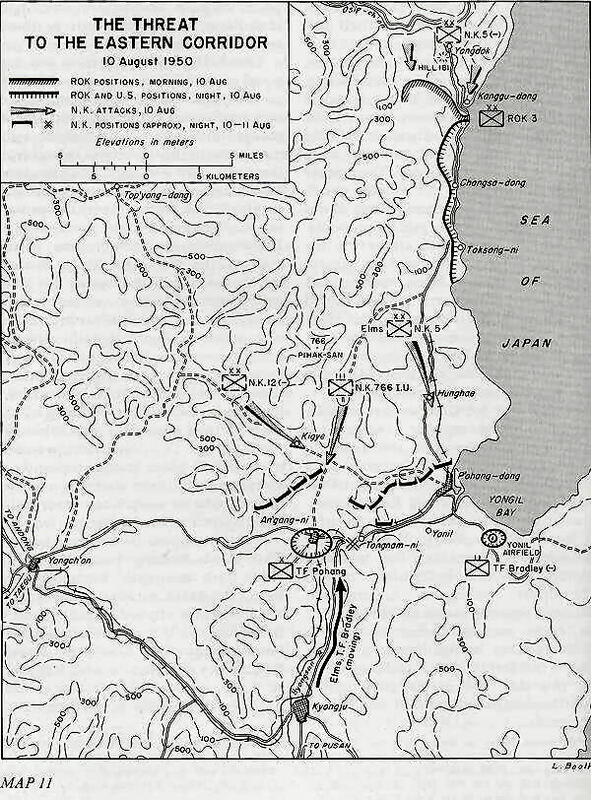 On 5 August the North Koreans attacked again and drove the ROK's south of the town to Hill 181. General Walker sent a personal message to Colonel Emmerich, the KMAG adviser with the ROK 3d Division, saying that the lost ground must be regained. Plans were made for a counterattack the next night. During the 6th, while these plans were being readied, it was possible from the ROK division command post to see, through field glasses, the North Korean and ROK troops locked in battle at grenade range on Hill 181. At this time the 1st Separate Battalion and the Yongdungp'o Battalion were inactivated and their troops absorbed into the ROK 22d and 23d Regiments. On 7 August, also, General Walker sent a message to Colonel Emmerich telling him that the bridge below Yong-dok at Kanggu-dong must be held. Up to this time an Engineer squad from the 24th Division had manned the demolitions on the 520-foot bridge there over the Osip-ch'on. The squad was now called back to Taegu, and control of the demolitions passed to Korean troops with directions that they were to blow the bridge only upon instructions from Major Britton of KMAG. Just after daylight, at 0500 on 9 August, a great explosion rocked the area of the bridge. The commanding officer of the ROK 22d Regiment had ordered the bridge blown without securing approval from Major Britton. About 350 ROK soldiers of the regiment were still north of the Osip-ch'on when the bridge dropped. Many of these soldiers drowned in trying to cross the deep estuary flowing into the Japan Sea. The ROK division chief of staff demanded that the regimental commander be relieved or he would court martial him and place him before a firing squad. The Korean Army relieved the regimental commander at once. As soon as Eighth Army learned that enemy forces had cut off the ROK 3d Division above P'ohang-dong, General Walker instructed Colonel Emmerich to meet him at Yonil Airfield. Emmerich radioed to the American cruiser Helena, offshore, for a helicopter to fly him to the airstrip, where he met General Walker, General Partridge, and Brig. Gen. Francis W. Farrell, Chief of KMAG. This task force moved toward P'ohang-dong and Yonil after dark, 10 August, over the main road through Kyongju. The command group and the 3d Battalion, 9th Infantry, except K Company, reached Yonil Airfield shortly before midnight and General Bradley assumed responsibility for the ground defense of the airstrip. At the K Company ambush casualties were greater. By afternoon, 7 dead and at least 4o wounded were reported. About 25 members of C Battery, 15thField Artillery Battalion, were also lost in this ambush. The enemy soldiers who had cut the road west of P'ohang-dong the night of 10-11 August and staged these ambushes apparently were from the 766th Independent Regiment. This regiment, leaving the 5th Division in the vicinity of Yongdok, had come in behind P'ohang-dong by way of mountain trails. Aerial reconnaissance showed the K Company ambush site was still held by enemy troops. Well aware of this, Captain Darrigo, KMAG adviser with the ROK 17th Regiment at An'gang-ni, volunteered to lead an armored patrol through to P'ohang-dong and Yonil. Darrigo rode the first of five tanks. Four F-51 fighter planes took off from Yonil Airfield and delivered a strike on the enemy positions at the ambush site just as the tanks arrived there. This air strike flushed enemy troops from concealment at just the right moment. Tank machine gun fire killed many of them; in one group about seventy North Koreans were caught in the open. That night, 11 August, the fighter planes at Yonil flew to another airfield for security, but returned the next day. From hills to the south and southwest of the airstrip enemy troops delivered long-range, ineffective fire against it. Even though this fire did no damage, it created a state of alarm. The next day, 12 August, 28-year-old Colonel Kim Hi Chun, acting on General Walker's orders, in a successful attack eastward from An'gang-ni, led his ROK 17th Regiment into Yonil, greatly to the relief of everyone there. The first news of the Fifth Air Force evacuation of Yonil Airfield came to General MacArthur's headquarters about 1600 that afternoon, 13 August, in the form of a United Press report, filed at 1320. This news report stated that an "Air Force spokesman announced that the Air Force was evacuating P'ohang air strip" because North Koreans were placing machine gun and mortar fire on the strip. A telephone call to Eighth Army headquarters at once disclosed that there was no mortar fire on the airstrip and that the report of enemy fire on the field was greatly exaggerated. It did, however, confirm that the Fifth Air Force Advance Headquarters had ordered the planes to leave the field. On 13 August the ROK's carried 313 of their wounded on board a supply LST at Changsa-dong. Later in the day at Toksong-ni, this LST struck rocks and opened a hole in its hull. All the wounded had to be transferred to another LST over a walkway in a heavy running sea. Dukw's (amphibious trucks) took 86 of the more critically wounded ROK's to a Korean hospital ship which arrived and anchored 500 yards offshore. The LST then sailed for Pusan. By 14 August the Capital Division, on Eighth Army order, had moved about twenty-five miles, from near Andong to the An'gang-ni-Kigye area, where it went into the line east of the ROK 8th Division. The ROK I Corps now established its headquarters at Yongch'on. The fighting in the vicinity of P'ohang-dong between North and South Koreans became a dog-eat-dog affair. Both sides lost heavily. The ROK's renewed their attack on 13 August when the 17th Regiment, reverting to control of the Capital Division, drove forward, supported by U.S. artillery and tanks from Task Force Bradley, to the hills north of P'ohang-dong. Task Force P'ohang attacked northward from An'gang-ni toward Kigye. In the fighting from 15 to 17 August, the Capital Division and Task Force P'ohang pushed the North Koreans back north of the Taegu-P'ohang lateral road and away from the Kyongju corridor in the neighborhood of An'gang-ni. Since about the end of July, the greater part of the N.K. 12th Division had been armed with the U.S. M1 rifle and the U.S. carbine. There was an adequate supply of ammunition for these weapons, but not always available at the front. The Japanese 99 rifles and ammunition with which the division was originally armed were turned in to the division supply dump at the end of July, when the supply of American arms captured from ROK units enabled the division to substitute them. When the N.K. 12th Division reached P'ohang-dong it was like a rubber band stretched to its uttermost limit. It must either break or rebound. The North Korean system of logistics simply could not supply these troops in the Kigye-P'ohang-dong area. Interv, author with Lt Col Paul F. Smith (G-3 Opns, 8th Army), 2 Oct 52: Interv, author with Lt Col Robert G. Ferguson (G-2 Sec, 8th Army), 2 Oct 52; Ltr with comments, Landrum to author, recd 28 Jun 54. ATIS Res Supp Interrog Rpts, Issue 4 (N.K. 8th Div), pp. 23-24; Ibid., Issue 99 (N. K. 12th Div), p. 46; Ibid., Issue 96 (N.K. 5th Div), p. 43. Crawford, Notes on Korea, 25 Jun-5 Dec 1950. ATIS Res Supp Interrog Rpts, Issue 4 (N.K. 8th Div), p. 24: EUSAK WD, 12 Aug 50, ATIS Interrog Rpt 507, Sr Col Han Ch'ong, CofS 8th Div, and interrog of Sr Sgt Yung Pyong Yong. ATIS Res Supp Interrog Rpts, Issue 106 (N.K. Arty), p. 70. EUSAK WD, G-3 Sec, 8-9 Aug 50; Ibid., POR 47, 10 Aug 50; GHQ FEC G-3 Opn Rpt 46, 9 Aug 50. EUSAK WD, Summ, 10-11 Aug 50, pp. 27-30; Ibid., G-2 Daily Sitrep, 9 Aug 50. and Br for CG, 10 Aug 50; Ibid., POR 89, 11 Aug 50. Emmerich, MS review comments, 30 Nov 57. Ibid. ; Maj. Perry Austin and Capt. Mario Paglieri (KMAG advisers with ROK 3d Div), It Can Be Done: A Lesson in Tactics, MS, copy in OCMH. Paglieri, Notes on ROK 3d Division, August 1950, MS, copy in OCMH; Interv, author with Emmerich, 4 Dec 51; Karig, et al., Battle Report: The War in Korea, p. 147. Interv, author with Farrell, 31 Dec 52 New York Times, August 14, 1950, dispatch by W. H. Lawrence. As finally constituted, Task Force Bradley comprised the 3d Battalion, 9th Infantry; Tank Company, 9th Infantry; A Company, 2d Engineer Combat Battalion; A Battery, 82d Antiaircraft Artillery (Automatic Weapons) Battalion; C Battery, 15th Field Artillery Battalion; 3d Platoon, Heavy Mortar Company, 8th Infantry; and medical and signal detachments. EUSAK WD, 10 Aug 50, Msg at 101735, CG EUSAK to CG 2d Div; Ibid., POR 87, 10 Aug 50; Ibid., Briefing for CG, 10 Aug 50; 1st Lt Robert J. Teitelbaum, Debriefing Rpt 47, Arty School, Ft. Sill, Okla., 14 Dec 51; 82d AAA Bn WD, Summ, Aug 50; Ltr, Lt Col D. M. McMains to author, 27 May 53 (McMains commanded the 3d Bn, 9th Inf of TF Bradley); Rpt, The Korean Campaign, Arty School Rep, Army Field Forces Observer Team 2. EUSAK WD, G-3 Jnl, Msgs 110120 and 110355 Aug 50; Ibid., G-3 Jnl, 12 Aug 50; GHQ FEC G-3 Opn Rpt 48, 11 Aug 50; Interv, author with Farrell, 31 Dec 52; Ltr, McMains to author, 27 May 53; Rpt, The Korean Campaign, Arty School Rep, AFF Observer Team 2. EUSAK WD G-3 Jnl, Msg 1335, 11 Aug 50; Davis, The 2d Infantry Division in Korea, July-September 1950. Davis, The 2d Infantry Division in Korea July-September 1950; Rpt, The Korean Campaign, Arty School Rep, AFF Observer Team 2; EUSAK WD, G-3 Jnl, Msgs 1331 and 1700, 11 Aug 50. Interv, author with Capt Darrigo, 5 Aug 53; Darrigo, Korean Experiences, 1950, MS, copy in OCMH; New York Times, August 13, 1950, dispatch by W. H. Lawrence 12 August from Yonil Airfield: Newsweek, August 21, 1950, pp. 16-18, article by Harold Lavine in Korea. EUSAK WD, Summ, 11 Aug 50; GHQ FEC Opn Rpt 49, 18 Aug 50; New York Times, August 11, 1950, Lawrence dispatch. ATIS Interrog Rpt 722, Issue 2, p. 51, Jr Lt Tu Chul Ki; ATIS Interrog Rpt 734, Issue R, p. 80, Capt Kim Tong II, Trans Co, 2d Regt, 12th Div. ATIS Res Supp Interrog Rpts, Issue 106 (N.K. Arty), p. 46; EUSAK WD, 30 Aug 50, ATIS Interrog Rpt 867; Ibid., POR 90, 11 Aug 50. USAF Hist Study 71, p. 50. Ibid. ; Ltr, McMains to author, 27 May 53; New York Times, August 14, 1950, dispatch by W. H. Lawrence. Transcript of telephone conversation between Gen. Roderick R. Allen, Deputy CofS ROK Army, and Collier, at 1600, 13 Aug 50, CofS files, FEC; Fonecon, Allen and Lt. Gen. Lawrence C. Craigie, Vice Comdr, FEAF, at 1930, 13 Aug 50, CofS files, FEC; Memo, Capt Webster W. Plourd. ROK Air Liaison Secy to Allen, 131645 Aug 50, CofS files, FEC. USAF Hist Study 71, p. 50; Ltr, McMains to author, 27 May 53. Colonel McMains stayed at Yonil with the 3d Battalion, 9th Infantry, until 14 September 1950, when the ROK 3d Division assumed responsibility for defense of the airstrip. Paglieri, Notes on ROK 3d Div, Aug 50; Austin and Paglieri, It Can Be Done, p. 4. Ibid. ; EUSAK WD, G-3 Sec, 15 Aug 50; GHQ FEC G-3 Opn Rpt 53, 16 Aug 50; Interv, author with Emmerich, 5 Dec 51. Paglieri, Notes on ROK 3d Div, Aug 50; Austin and Paglieri, It Can Be Done, pp. 9-10; EUSAK WD G-3 Sec, 16-17 Aug 50; GHQ FEC G-3 Opn Rpt 54, 17 Aug 50; New York Herald Tribune, August 17, 1950. EUSAK WD, 21 Aug 50, ATIS Interrog Rpt 721, Lt. Pak Kwang Hon; Ibid., 22 Aug 50, ATIS Interrog Rpt 734, Capt Kim Tong Il (2d Regt, 12th Div), and related interrog of Kim in ATIS Interrog Rpts, Issue 2, Rpt 734, p. 80, Rpt 723, p. 55, Sgt Im Chang Nam; ATIS Res Supp Interrog Rpts, Issue 99 (N.K. 12th Div), p. 46; New York Times, August 14, 1950. Interv, author with Farrell, 31 Dec 52; EUSAK WD, 13 Aug 50; Ibid., Summ, 1-31 Aug 50; GHQ FEC G-3 Opn Rpt 50, 13 Aug 50. New York Times, August 15, 1950, P'yongyang broadcast monitored in Tokyo. Capt Kim Tong Il (see n. 28): ATIS Res Supp Interrog Rpts, Issue 99 (N.K. 12th Div), pp. 46-47; 23d Inf WD, 17 Aug 50. ATIS Res Supp Interrog Rpts, Issue 99 (N.K. 17th Div), pp. 46-47; EUSAK WD, 30 Aug 50, ATIS Interrog Rpt 869, Lee Son Chol; Ibid., 734, Kim Tong Il; ATIS Interrog Rpts, Issue 2, p. 11, Rpt 704, Jr Lt Kim Dok Yong, 2d Regt, 12th Div, Rpt 722, p. 51, Jr Lt Tu Chul Ko, 1st Regt, 12th Div, and Rpt 724, p. 58, Lt Chang Chin Sop, 1st Regt, 12th Div. EUSAK WD, 20 Aug 50; Ibid., Aug 50 Summ, 19-20 Aug; Ibid., G-3 Sec, entry 9, 20 Aug 50; Ibid., G-3 Jnl, 20 Aug 50; GHQ FEC G-3 Opn Rpt 58, 21 Aug 50. New York Times, August 21, 1950. EUSAK WD, 22 Aug 50, ATIS Interrog Rpt 721, Lt Pak Kwang Hon, Rpt 722, Jr Lt Tu Chul Ki, Rpt 723 Im Chang Nam, Rpt 727, p. 64, Sr Sgt Choe Chol Hak, and Rpt 734, Kim Tong Il: ATIS Interrog Rpts, Issue 2, p. 51, Jr Lt Tu Chul Ki. A survey of 825 North Korean prisoners revealed that they listed shortage of food as most important of all factors causing low morale. See USAF Hist Study 71, p. 52.